It's another bleak day on Wall Street. Bleak outlooks from Time Warner, Intel and Alcoa combined with more evidence of rising unemployment sent stocks sharply lower Wednesday. Major indexes fell more than 3 percent including the Dow Jones industrials, which lost 245 points. Unlike the panicked swings seen last fall, however, the decline was more orderly, and some retrenchment had been expected following sharp rises in the final days of 2008 and into 2009. Wall Street has been absorbing poor economic and corporate news far better since last November as some have dared to hope for a recovery in the second half of this year or early 2010, but the latest round of unnerving news proved to be too much to set aside. Joe Saluzzi, co-head of equity trading at Themis Trading LLC, said the market is simply reacting to the day's drubbing of bad news. "One too many punches and the fighter finally went down," he said. Media industry bellwether Time Warner Inc. said Wednesday it would book a $25 billion impairment charge in the fourth quarter for its cable, publishing and AOL units, while Intel Corp. said it now expects fourth-quarter revenue to drop a greater-than-expected 23 percent on a further weakening in demand from computer makers. The company already reduced its forecast in November. Alcoa Inc. had jolted investors late Tuesday with an announcement that it would slash its annual output by more than 18 percent and cut its global work force by 13 percent. Time Warner sank 70 cents, or 6.5 percent, to $10.28, while Intel dropped 88 cents, or 5.8 percent, to $14.49. Alcoa tumbled $1.23, or 10 percent, to $10.89. The market was already worried about what the Labor Department's report on employment would bring on Friday, and received a disappointing harbinger Wednesday as the ADP National Employment Report said private sector employment fell by 693,000 in December, more than had been expected. The report is an unofficial gauge that the market has been increasingly monitoring as U.S. job losses mount. The ADP report is making investors question whether government steps to revive the economy will prove sufficient. "The market has shrugged off some bad news recently, and it's starting to get to the point where it can't do that anymore," said Scott Fullman, director of derivatives investment strategy for WJB Capital Group. The Dow has rallied about 20 percent since its multiyear lows in late November, and the Standard & Poor's 500 index has surged nearly 25 percent. The S&P 500 began Wednesday's session up 3.5 percent for the first three trading days of 2009. "We've had a big move," Fullman said. "What we're looking at now is just people getting a little cautious here." The Dow Jones industrials are ending down 245 points, or 2.7 percent, at the 8,770 level. The Standard & Poor's 500 index is down 3 percent and the Nasdaq composite is down 3.2 percent. The Russell 2000 index of smaller companies fell 19.05, or 3.70 percent, to 495.66. Declining issues outnumbered advancers by about 5 to 1 on the New York Stock Exchange, where volume came to a light 902.6 million shares. Bond prices were mixed Wednesday. The yield on the benchmark 10-year Treasury note, which moves opposite its price, rose to 2.49 percent from 2.47 percent late Tuesday. The yield on the three-month T-bill, considered one of the safest investments, edged fell to 0.08 percent from 0.14 percent. The dollar fell against most other major currencies, while gold prices declined. Light, sweet crude slumped 12 percent, falling $5.95 to settle at $42.63 a barrel on the New York Mercantile Exchange. The decline, which erased a week of gains, came after the government reported commercial crude oil inventories jumped well beyond the increase analysts expected. The weak economy has eroded demand. "Maybe the market was a little giddy starting the new year," said Anton Schutz, portfolio manager of the Burnham Financial Industries Fund and the Burnham Financial Services Fund. But Schutz doesn't believe Wednesday's decline will deter the market's recent upward trend. "I don't think you can get discouraged on single days at this point in time," he said. "We've all seen a pretty good trend off the lows. I think we're going to continue to have a choppy environment." "Nothing goes straight up or straight down," echoed Keith Springer, president of Capital Financial Advisory Services. "You do have some people who get skiddish and start taking some profits, but I don't think the up trend has been broken here." The drop in oil weighed on the energy sector. Chevron Corp. fell $3.39, or 4.4 percent, to $73.96, while Occidental Petroleum Corp. fell $3.79, or 6.2 percent, to $57.85. Technology stocks were among the biggest decliners after the Intel announcement. Microsoft Corp. fell $1.14, or 5.5 percent, to $19.62, while Qualcomm Inc. fell $1.77, or 4.8 percent, to $35.38. Financial shares fell after Oppenheimer & Co. analyst Meredith Whitney warned that banks could have to raise fresh capital in 2009 as they face continued deterioration of their balance sheets. JPMorgan Chase & Co. fell $1.48, or 5 percent, to $28.40, while Citigroup Inc. fell 21 cents, or 2.8 percent, to $7.25. The market's economic worries had been calmed a bit in recent days by President-elect Barack Obama's proposal to slash taxes and help businesses. 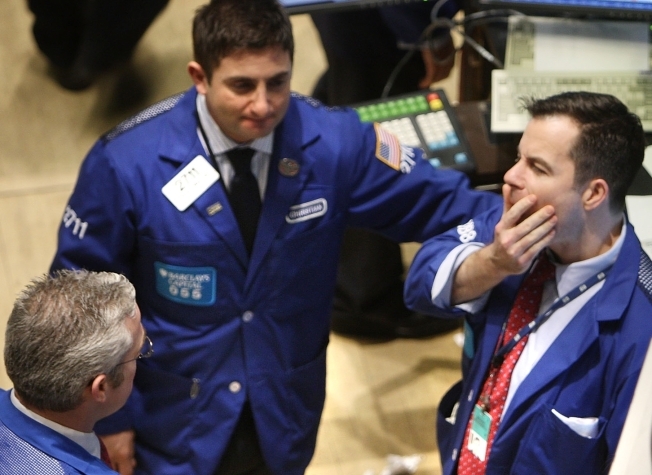 On Tuesday, Wall Street overcame gloomy economic readings to finish with a moderate advance. But investors are anxious for more details of the stimulus package, which could cost as much as $775 billion. Overseas, Japan's Nikkei stock average rose 1.74 percent, and Hong Kong's Hang Seng index fell 3.37 percent. In Europe, Britain's FTSE 100 fell 2.83 percent, Germany's DAX index fell 1.77 percent, and France's CAC-40 fell 1.48 percent.